PARIS (AP) — Ronald Reagan's children gathered at his bedside Saturday as word reached the White House that the health of the 93-year-old former president had seriously deteriorated. Former President Ronald Reagan appears in his Los Angeles office in 1990. White House officials who checked on the former president's health Friday were told "the time is getting close," a person familiar with Reagan's health, who did not want to be identified, told The Associated Press. "It could be weeks. It could be months." The Reagan family's chief of staff, Joanne Drake, said his children from his marriage to Nancy, Patti Davis and Ron, were at the Reagan home in the Bel-Air area of Los Angeles. "This is it," Nancy Reagan told CBS News correspondent Mike Wallace. "I said is it conceivable that it could happen this weekend? She said, yes, yes," Wallace told CBS radio. Reagan, who has lived longer than any other U.S. president, has been out of the public eye since disclosing a decade ago that he had Alzheimer's disease. "He's 93 years old. He's had Alzheimer's disease for 10 years. There are plenty of rumors. When there is something significant to report I will do so," Drake said. Drake said she could not comment on the CBS report. She also declined to give details on the former president's condition. Three dozen reporters and television cameras clustered across the street from the Reagan's mansion but there was nothing to be seen beyond the gate and the long driveway that led to the hidden home. There were no police or Secret Service escorts visible in the tree-lined street. Rumors about Reagan's health arose Friday and his office in California said it had received more than 300 calls over the past two days. "I hope he lives many, many more years. He's an idol of mine," Gov. Arnold Schwarzenegger said as he toured a broken levee west of Stockton Saturday. Mitch Daniels, who was political director for the Reagan White House in the mid-1980s, issued a statement from his home in Indianapolis upon hearing the latest news on the former president. "Even though the day must ultimately come, it will be hard to say goodbye. Few Americans have done more for their country than Ronald Reagan," Daniels said. News about Reagan's health came as President Bush arrived in Paris, the second stop on his trip to Europe. Former first lady Nancy Reagan, at a fund-raiser last month for human embryonic research, described the toll that Alzheimer's has taken on her husband. Nancy Reagan and others believe the use of stem cells from embryos could lead to cures for such illnesses as Parkinson's and Alzheimer's. 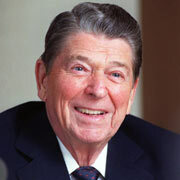 Reagan celebrated his birthday Feb. 6 in seclusion at his Los Angeles home. The nation's 40th chief executive, who broke his hip in a fall at his home in 2001, has rarely been seen in public since his poignant letter announcing he had the memory-sapping disease. In the note on Nov. 5, 1994, Reagan said, "I now begin the journey that will lead me into the sunset of my life. I know that for America there will always be a bright dawn ahead." He also has a deceased daughter, Maureen, from his first wife, Jane Wyman, and an adopted son, Michael.